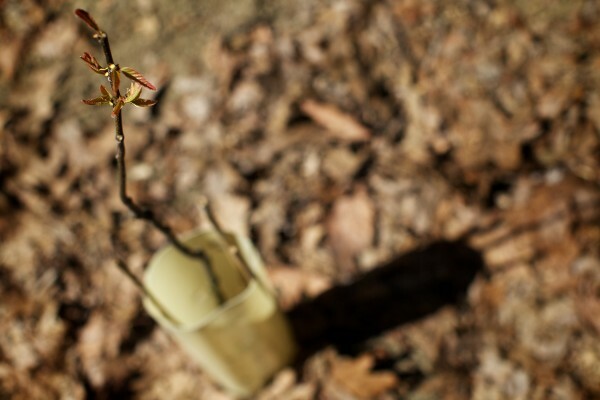 A tiny American chestnut tree sprouts leaves at its new home in Portland's Baxter Woods Tuesday. 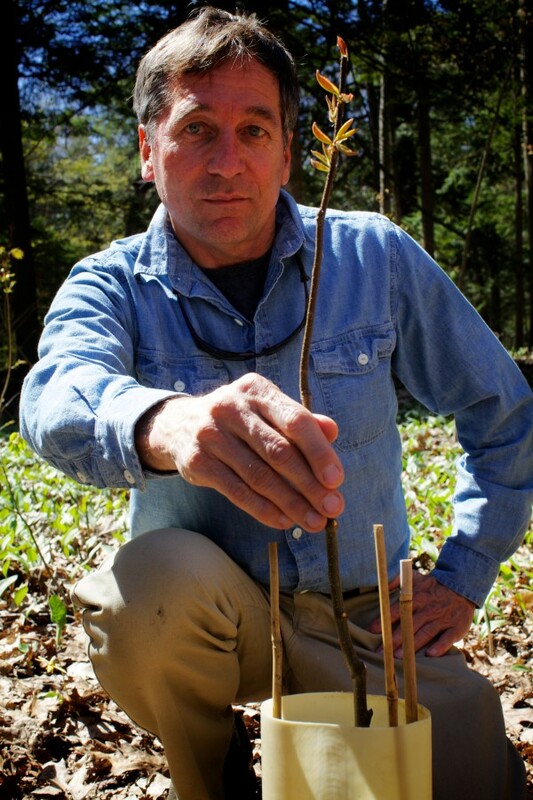 Jeffrey Tarling, Portland's city arborist, shows off a new American chestnut tree planted in Baxter Woods Tuesday. PORTLAND, Maine — Portland city officials are hoping to finally overcome the century-old ailments that stripped the Forest City of some its most prominent trees. The latest and perhaps most high-profile step in the fight back came as Portland became one of the first to plant the latest version of blight-resistant American chestnut trees, the results of 30 years of backcross breeding and more than $30 million in nationwide research, according to the city. American chestnut trees were nearly wiped out by an Asian bark fungus introduced to the country in 1904, and scientists have spent much of the last century trying — until recently with little success — to proliferate trees immune to the blight. 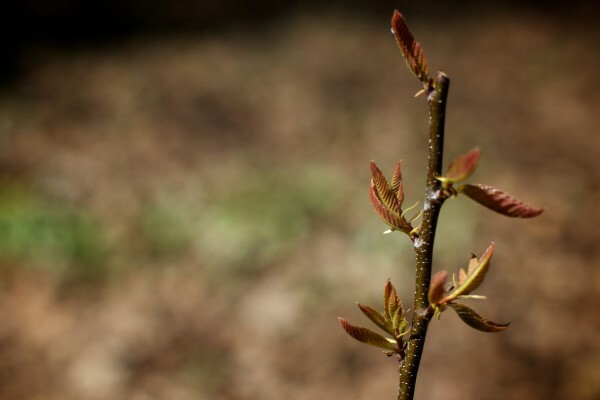 Strategies to restore the American chestnuts to the former prominence have included simply replanting lonely survivors in hopes that they were naturally resistant to the blight — as well as the tedious, expensive and time-consuming crossbreeding with other chestnut trees in hopes of creating that resistant quality. Tarling said the two trees that Portland officials planted last week in Baxter Woods represent the latest in the latter effort, a balanced version of the tree that incorporates enough of the hardier Chinese chestnut to ward off the fungus but not so much that it loses its distinct American chestnut physique, which is taller and browner, among other aesthetic differences. “We’ve been trying the American chestnut for a number of years, and this is the latest one,” Tarling said. American chestnuts in their heyday were for more than just roasting on an open fire at Christmas time, Tarling said. The rot-resistant wood was valued for its timber and was used for railroad ties, home construction and furniture. That fungal blight traveled by raindrops, animals and, perhaps most devastatingly, spores in the air. It caused an estimated three billion American chestnuts — covering an approximately 200 million acre area along the eastern United States — to wither and die. Mayor Michael Brennan said the city has two more of the newest blight-resistant trees still to plant, making a total of four donated by the Maine Chapter of the American Chestnut Foundation. American chestnuts aren’t the only trees in Portland to get a boost under Brennan, who sees the nut-bearing trees as at least an emblematic part of his aggressive sustainable foods initiative launched last year. The city is also in the process of planting 12 fruit trees — mostly at local schools. The fruit trees will bear apples and peaches, Tarling said. Brennan’s sustainable foods initiative advocates for programs encouraging wider distribution of locally produced food, aims to increase the amount of local food served in the Portland Public Schools from seven percent today to 50 percent by 2015. Rounding out the re-treeing of Portland is the steady and ongoing planting of elm trees around the city, Tarling said. The majestic trees once provided forest-like canopies over otherwise urban city streets, he said, but like the American chestnuts, faced a near total wipe-out in the 20th century. Dutch Elm Disease tore through Maine’s elms in the 1920s and 1930s on what would become a nationwide rampage. “Portland was said to have lost 20,000 elms,” Tarling said, adding that, for comparison, the city has a total of about 19,000 street and open space trees in total on public land today. Tarling said city officials are planting about 20 elms per year around the city, with a recent bump of 40 new elms planted on the Eastern Promenade recently. The new elms are from a variety of strains — Princeton elms and Valley Forge elms among them — and are being planted at intervals that discourage the transmission of disease through connected roots or canopies.